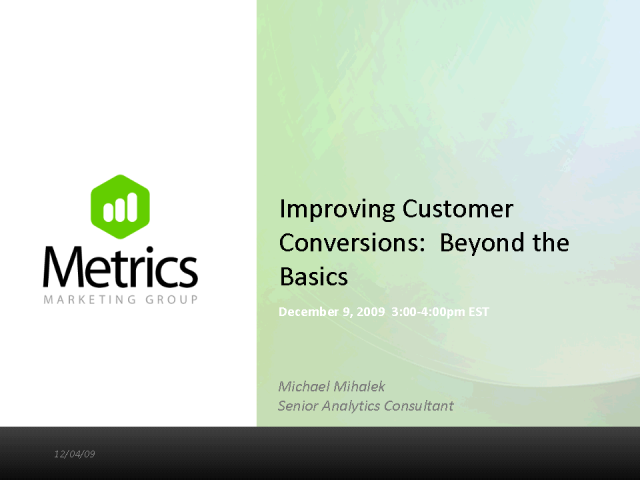 Improving Customer Conversions: Beyond the Basics; How Advanced Testing and Analytics Impact Your Conversions. In this presentation, we will look at challenges associated with serial A/B testing, and some of the experimental design solutions that can help your company get to the next level in testing. Tradeoffs of volume, time, and clarity of results with several methods will be discussed. A working example comparing fractional factorial, full factorial and A/B approaches will also be reviewed. This presentation is geared towards marketing managers and campaign design teams.